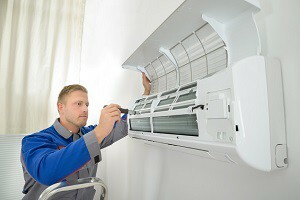 For the most part, modern air conditioning systems are extremely reliable and require minimal maintenance. They provide your Summerville home with cool air and keep you and your family comfortable throughout the summer months. Most of the time, you don’t even need to give them a second though. However, like all major appliances, your air conditioner can develop some problems, and it when it does, your home can become extremely uncomfortable, and it could leave you and your family in an unsafe situation. If and when you do encounter problems with your air conditioning system, the professional Summerville air conditioning technicians at Stay Cool Heating and Air can help you troubleshoot and repair the system. We also offer preventative maintenance services to help you keep the system effective and efficient at all times. The average homeowner may be able to resolve some common problems on their own, but it’s never a bad idea to call a professional for assistance. It’s not uncommon for an air conditioning system to fail to operate at the beginning of the cooling system. If the thermostat is defective or not set properly, it will prevent the system from turning on. If this is what’s causing the problem, you can most likely resolve the issue on your own. Simply check your thermostat and make sure that it’s in the “cooling” position. If you have an automated thermostat, make sure the timer is not set to be off during this period. You may need to contact an HVAC contractor to have your Summerville home’s thermostat re-calibrated. Another reason the unit may not be turning on is that it’s not receiving any power. To determine if this is the cause, check your fuse or circuit breakers and see if any have tripped. If it seems to be an electrical issue, call a professional immediately. Working with your electrical system is very unsafe, so do attempt this on your own. If your air conditioner is blowing warm air, it could be that you simply have dirty filters. The system may be producing cold air but unable to distribute it properly. You should replace or clean your air filters at least once a month during the cooling season. If your filters have been changed, you should make sure that your outdoor unit is on and running. If it is on and is not running, call our professionals to have your system inspected. When your Summerville air conditioner freezes, it could be due to a number of different problems. One possibility is a lack of proper air flow. Check your filters and replace or clean them as necessary. You should also ensure that the coils are free of dirt, debris, or other obstructions. While a homeowner will be able to clear away debris and change air filters, you will need to call a certified technician to replace any electrical components. If you’re looking for an air conditioning contractor in Summerville, call Stay Cool Heating and Air at 843-819-5392, or fill out our online request form.